This unique, highly acclaimed special, stars Marlo Thomas, and features such celebrated talents as Alan Alda, Harry Belafonte, Mel Brooks, Rita Coolidge, Billy De Wolfe, Roberta Flack, Rosey Grier, Michael Jackson, Kris Kristopherson, The New Seekers, Tom Smothers, The Voices of East Harlem and Dionne Warwick. Free To Be...You And Me is a journey into the endless possibilities of life, rich with positive, life-enhancing messages about growth and change. In a series of live action and animation, positive messages of self-esteem are illustrated through songs, stories and laughter. 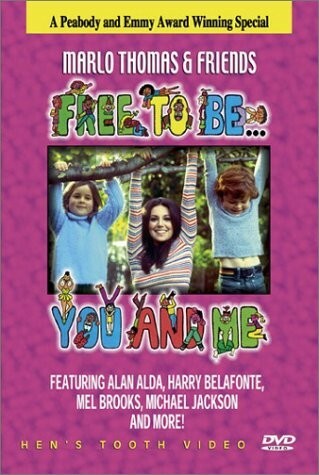 Based on the groundbreaking children's album Free to Be You and Me, it explores children's authentic experiences, their dreams and concerns, their fears and fantasies. Among the highlights are Marlo Thomas and Mel Brooks in Boy Meets Girl and football hero Rosey Grier, singing It's Alright to Cry. In addition, Michael Jackson and Roberta Flack perform When We Grow Up and Alan Alda narrates the tale of Atalanta. This enchanted fun-filled voyage of discovery for adults and children to enjoy together is a superb addition to any family's home entertainment library. Like Schoolhouse Rock, Marlo Thomas's 1970s children's TV show, Free to Be… You and Me met with immediate success and became a treasured piece of entertainment over the years. Based on her award-winning album of songs, skits, and comedy, Free to Be explores the infinite possibilities of childhood. Fans know most of the skits in the 45-minute show verbatim, and it's easy to see why right from the beginning with an infectious title track followed by a puppet sketch featuring Thomas and Mel Brooks as newborns.